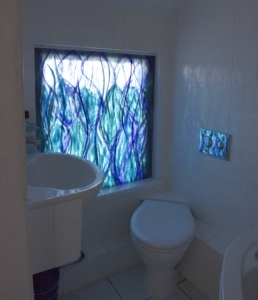 For those of us keen to brighten up their home with the beauty of natural light, fused glass art windows are a perfect way to do it. They make for a gorgeously unmissable addition to the home, sending vivid colours diffusing through any room. They’re a practical alternative to what you might consider more traditional plain glass windows, too. Just like any other window that you might see in your average home, fused glass panels utilised like this still bring light into the home and can keep heat safely sealed within. They aren’t exactly stained glass windows, but they can easily serve as a practical replacement for those looking to get that highly desired look without the many drawbacks. Fused glass is much lighter than stained glass, for one, and it can easily complement more modern choices of décor. What’s more, we create every piece by hand. That’s exactly why we can ensure that all of our fused glass art can be as bespoke and personalised as you’d like it to be. From colour matching the piece to samples from your kitchen all the way to bringing a fully fledged sketch to life, our mission is to create something for your home that’s truly one-of-a-kind. We often say that your imagination is the limit, but we really mean it! Our fused glass art windows are definitely the perfect thing to let light in, but there’s plenty more to see here at The House of Ugly Fish. Just about all the incredible designs we’ve created in the past could make for some great windows or door panels, so we mean it when we say that there’s something for everyone here with us. Pick up the phone or drop us an email, and we’ll hopefully be getting started on your perfect piece before you know it! Our full contact details can be found right here on our website.